TOKYO, JAPAN, October 9, 2018 --- NTT DOCOMO, INC. (DOCOMO) announced today that it has added Wi-Fi® functionality to its Japan Welcome SIMTM prepaid SIM card service to provide travelers to Japan with fast and easy access to "docomo Wi-Fi" hotspots nationwide without any complicated set-up. Despite improvements to Japan's public wireless LAN in the lead-up to 2020, a survey conducted by the Japan Tourism Agency found that the biggest complaint inbound travelers have when using Wi-Fi is the cumbersome authentication process. DOCOMO's authenticated SIM, however, overcomes this by seamlessly switching between the DOCOMO mobile network and docomo Wi-Fi hotspots. In conjunction with the service enhancement, DOCOMO will begin offering "Plan XL", a 2 GB plan catering to customers seeking extra data and higher speeds, on October 9. The first 999 customers to apply can purchase the plan for just 1,944 yen, down from 3,024 yen (must be purchased during promotion period using coupon code; please see https://wow-j.com/en/feature/jwsim/cp1/). Prior to receiving the SIM card, there is a requirement to watch certain advertisements and fill out a survey. This service is only available in certain areas. Indicated communication speeds are the maximum values based on technical standards and are not representative of actual communication speeds. Actual communication speeds may vary depending on the network environment and user's device. "Wi-Fi" is a registered trademark of the Wi-Fi Alliance. 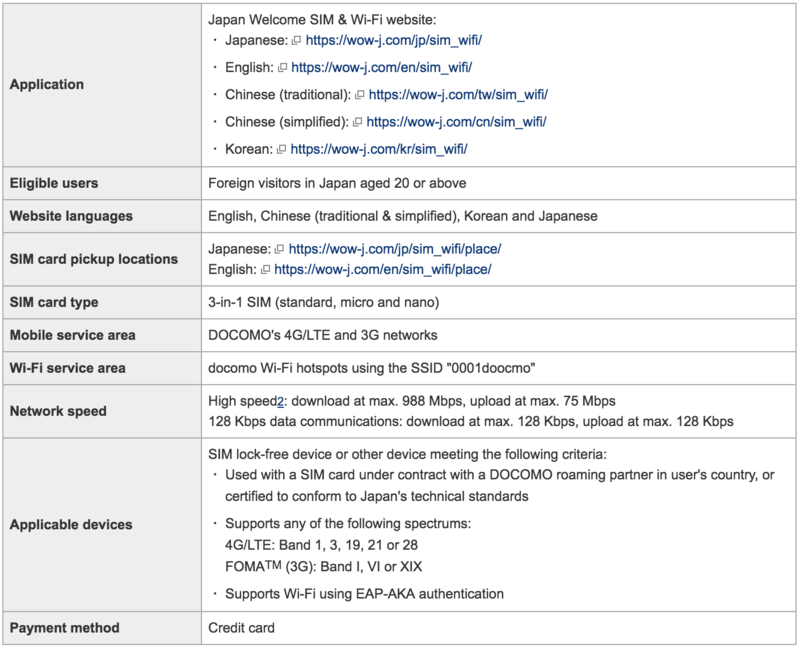 "Japan Welcome SIM", "Japan Welcome SIM & Wi-Fi" and "FOMA" are trademarks of NTT DOCOMO, INC.